Sarees are known as a tradition for Indian women, as it can be worn on any occasions from casual to any traditional events. Specially, printed sarees provide graceful look to every women and so it is most popular outfit among Indian women. Sarees prints have evolved from local rural to urban markets, bringing the traditional fashion of rural ethnic local communities to western community. In urban area people are more influenced by western look, so designer club Indian and western design to get an attractive look for sarees these days. The digital printed sarees are printed by special machines and so it is called digital prints. A computerized machine is used to make print on sarees which give an attractive digital look and for that women love it to wear. Before printing, these sarees are plain & their design is prepared on special computerized machines which give them an elegant digital type look. The reason for their popularity is the chic & contemporary look these sarees gives to the wearer. 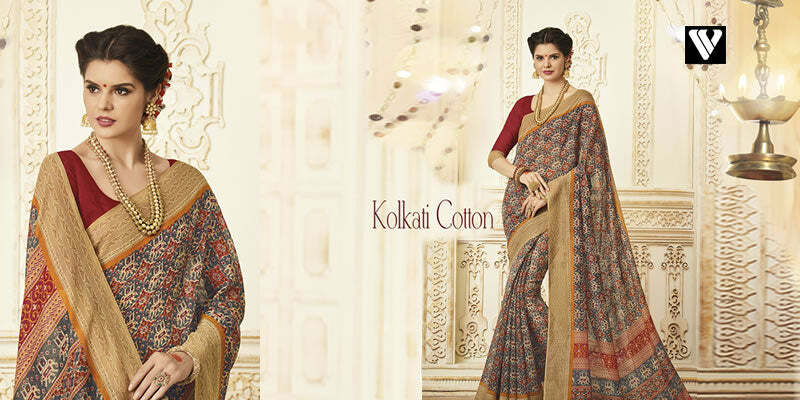 The charm, pride & elegance offered by them are unmatched with any other sarees. Women have started wearing digital print sarees because of their attractive prints & new concept. There are beautiful prints designs available in market, flower print sarees is one of the common print pattern. Sarees with this print are in trend as it looks very beautiful on any body type. The flower pattern can be small, large or medium, some sarees also have leaves and branches along with flower. VestureVogue has a wide collection of such sarees in vibrant colors. Bandhani prints emerge from Rajasthani tradition. Bandhani print sarees are one of the most commonly worn garments by women in Rajasthan. This Rajasthani sarees typically made using these traditional techniques, the most prominent of which is the tie and dye technique called Bandhini or Bandhej. They use a lot of bright colors, and one saree can even display many different hues. Bandhani is the most significant print work and hence one can find variety of designs and colors to choose from. Georgette sarees with print work have fewer embellishments on them. So this type of saree is best for working women. It can have various patterns made from Hand block, roller, floral, and etc. These comfortable and light wear sarees has gained a lot of popularity among modern women. Casual printed sarees can be worn in monsoon season because they are easy-to-maintain and light in weight. You can easily washout mud from this sarees and also they take lesser time to dry up. With such easy-maintenance it will remain in trend for a long time. Cotton sarees are included in the latest fashion from our collection, beside this we also maintain a stability for our traditional printing style in cotton. Explore a huge collection of traditional printed cotton for wedding ceremony and social gathering or formal get together. You can get a total festival look with the traditional printed cotton collection. The fashion industry is upfront these days to give a new design every day. The patterns and designs on the print of sarees changes frequently. Every new design is replaced by the latest designer patterns. So, while buying a Printed Sarees Online, look for the latest trends and styles in the market and choose the best. VestureVogue has a wide collection of sarees as per the occasion and you can buy all the latest trendy printed sarees from the comfort of your home.